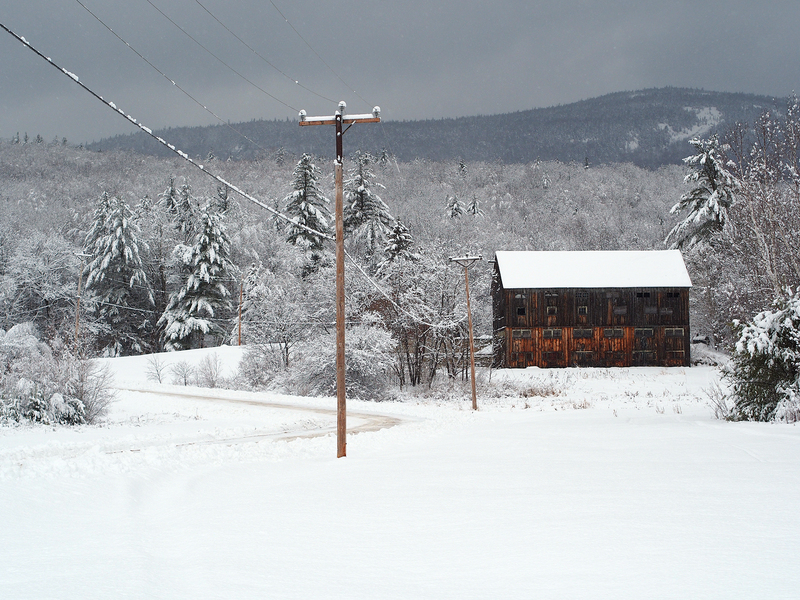 An old barn in Evergreen Valley, Stoneham, Maine. Speckled Mountain is in the background. 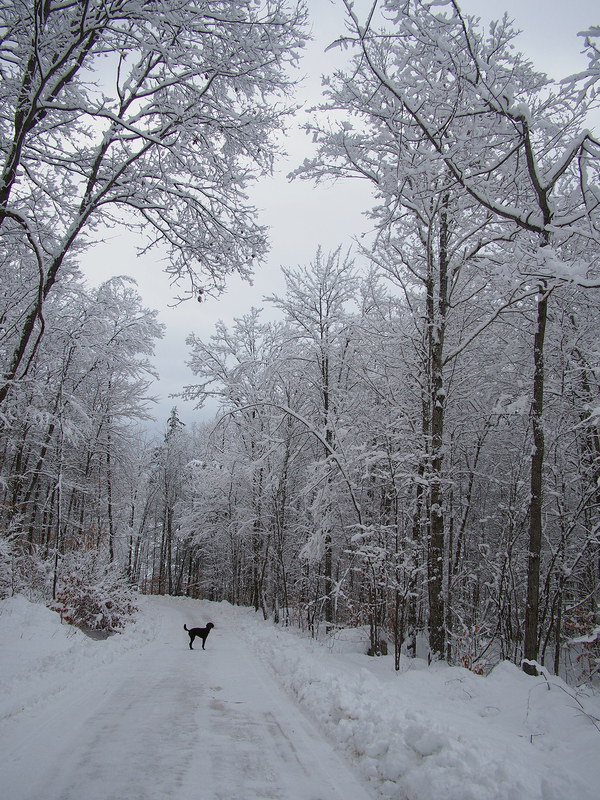 Enjoying the beauty of winter in Maine! 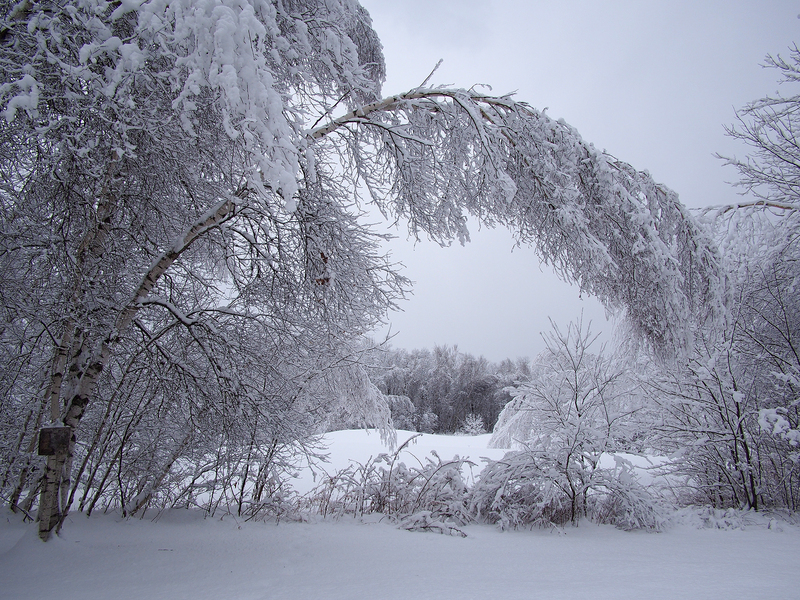 This past snowfall was a very wet, heavy snow, of which you can see evidence by its weighing down this birch tree to form a perfect, beautiful arch. 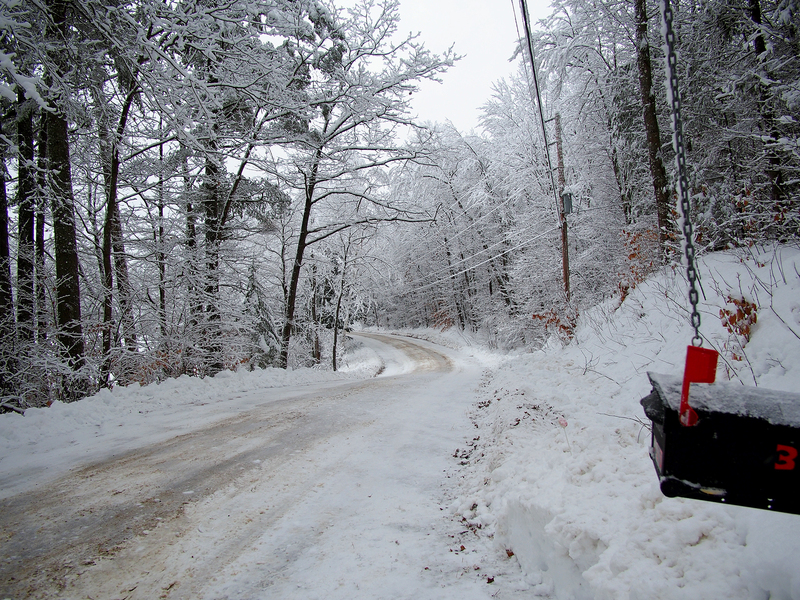 Our driveway plow guy is in touch with street plow people so he knows when to come and do our driveway. 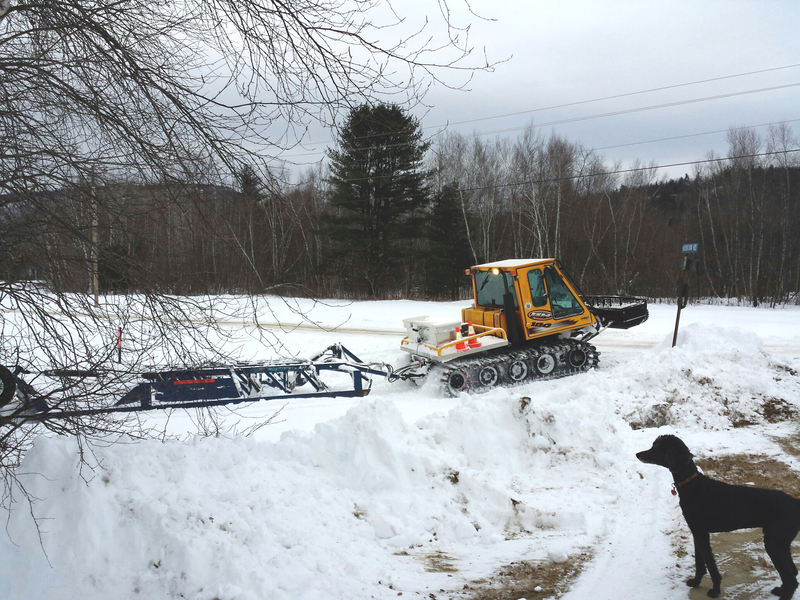 He usually follows right on the heels of the main road plow person. Beneath the house, on the bench, we’ve placed a 50 lb salt block, but so far no deer or moose have come to take a lick. Little did I know how Divine Providence guided me to find this most unusual autobiography, translated to English from the original Yiddish. Rachel is a young Jewish woman from a Russian shtetl, who agrees to marry a Jewish emigrant pioneer who is homesteading in North Dakota. How this obscure book made its way to my little rural library in Maine is a mystery! But “Rachel Calof’s Story” was so fascinating that I could not put it down and read it cover to cover in one sitting! At the age of 4, Rachel’s mother passed away. From that time onwards, it seems, life for her and her siblings was one of true misery. The physical and emotional abuse they suffered at the hands of their stepmother and, later, other relatives makes Cinderella’s dreary pre-prince existence sound like a cakewalk! The possibility of a shidduch (arranged marriage) to a Jewish man in the “goldeneh medina” – – America – – seemed to be her only hope of escaping her cruel life in Russia. Sadly, by agreeing to the match, she would never see her beloved, abused and sickly siblings again, a fact that tormented her for the rest of her life. Despite a few misadventures along the way, Rachel finally meets her arranged husband-to-be when she passes through Ellis Island — and thankfully, he does seem to be a decent fellow. Coming from a village in Russia, she is overwhelmed by the hustle and bustle of New York, so she doesn’t mind when her fiance tells her that they will be traveling by train to the then-new state of North Dakota, where he and his recently-arrived relatives would stake a claim and homestead land. Who could imagine a Jew owning land and becoming a successful farmer in Russia at the time of the czar? It sounded like a dream come true and Rachel decided she would do anything and everything necessary to make her future husband’s dream a reality. And yet, Rachel not only endured the many trials and tribulations she faced, she persevered and eventually triumphed, meanwhile raising nine children who miraculously lived to adulthood in a place where the simple act of giving birth was commonly a life-threatening endeavor for both mother and infant.
. . . now suddenly a wonderful and spontaneous excitement seized us all, old and young alike. For years, there had been little cause for celebration for any of us, and now it was as though a great yearning to be joyous, to reaffirm that life was worthwhile, was expressed through this (bris). 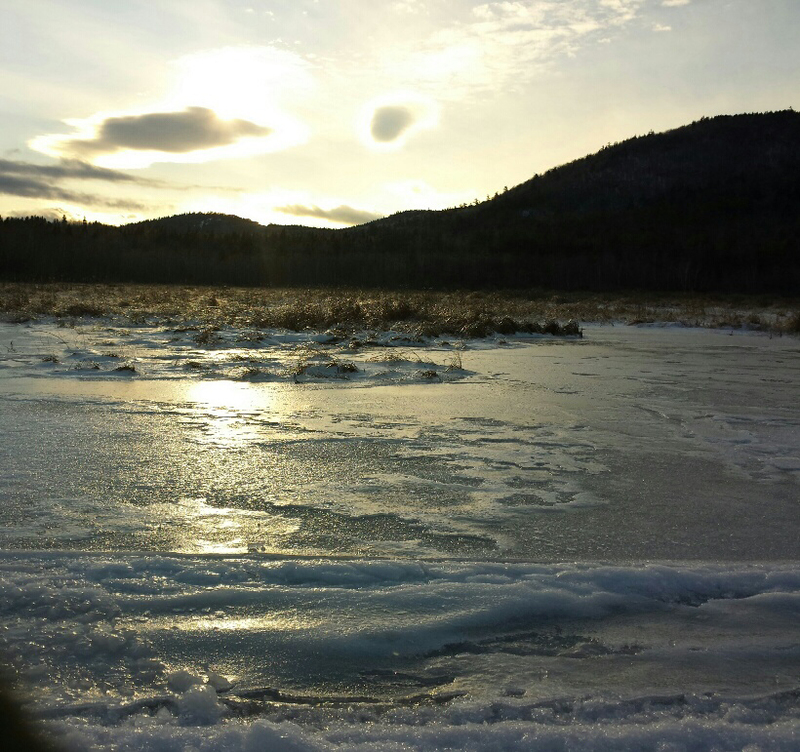 We live very close to the NH border, and the White Mountain National Forest abuts our property (most people do not realize that the White Mountains stretches beyond New Hampshire into Maine). As such, wilderness is literally in our backyard. 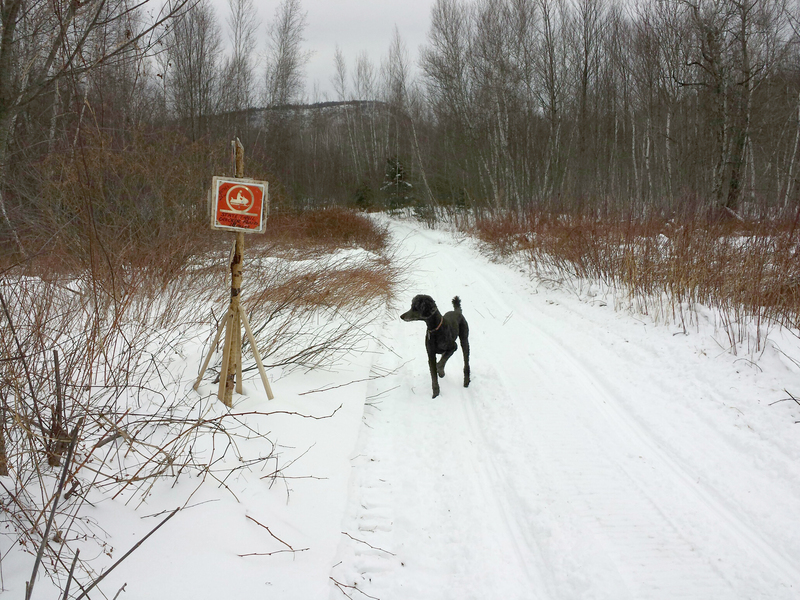 In winter, there are many snowmobile trails within walking distance, but because we are in a somewhat out-of-the-way location, they are rarely used. We do not snowmobile. Snowmobiles are quite expensive (about $10K – $12K new), and they are also pricey to rent ($165 for a couple of hours), so we haven’t even tried it. But that doesn’t mean we can’t benefit from snowmobile trails! 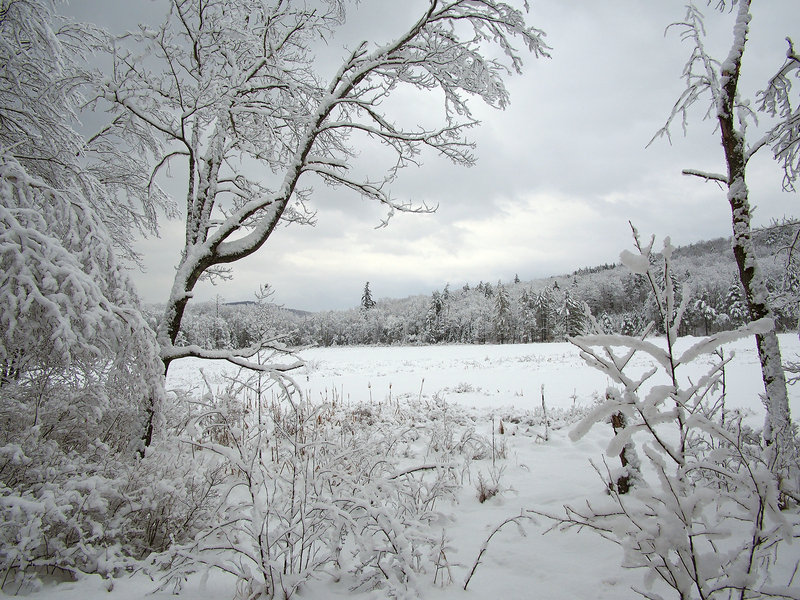 A snowmobile trail is an official winter-only backcountry “road” that is maintained by snowmobile clubs or the State of Maine. By “maintained” I mean that they have trail markers, plus signage telling riders how many miles it is to gas, food, lodging, or various locations along the way. They are a narrow pathway (about 6′ – 8′ wide in our area) cleared of trees and obstacles. These trails are found throughout the northeast and there are continuous trails that stretch hundreds of miles, all the way into Canada. After a heavy snowfall, volunteers use expensive “snow groomers” to compact the snow and ensure that the trails are safe, removing debris such as fallen branches, and covering or moving protruding rocks if necessary. 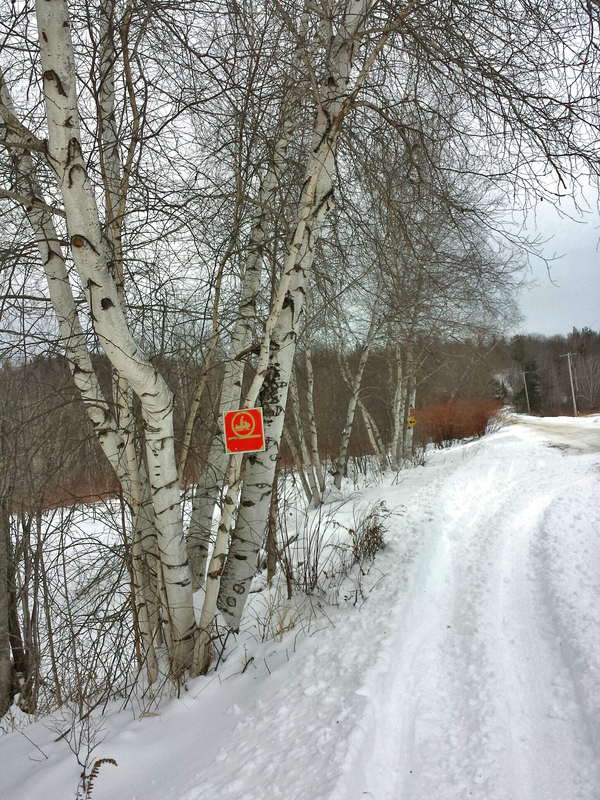 They also place “caution” signs so snowmobilers will be made aware of stream crossings if there are no bridges (doable only if the water has frozen and is thick enough to hold the weight of the snowmobiles and riders). 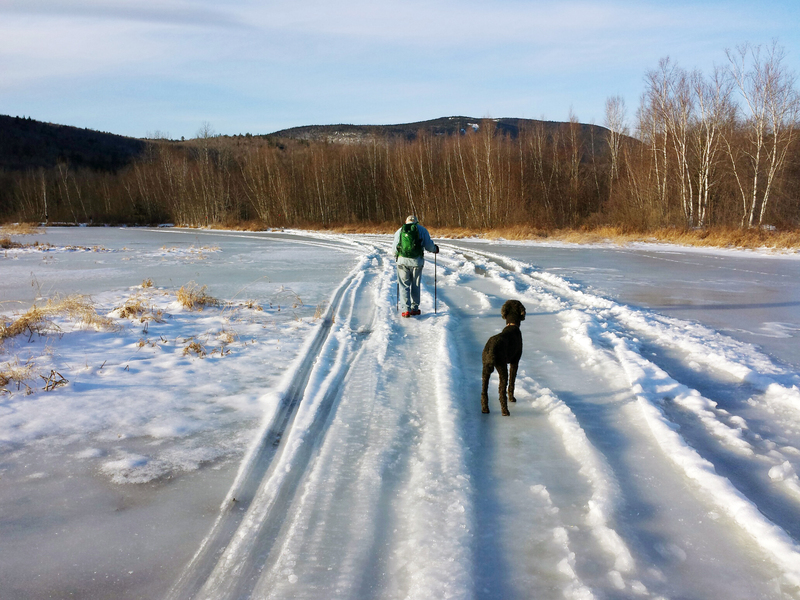 But in my area, because these trails are so underused, they are perfect for snowshoeing and cross-country skiing, since one rarely encounters snowmobilers. (Skiing or snowshoeing would be downright dangerous on a heavily used snowmobile trail: it would be like walking on a freeway between speeding cars). They are rare in my area, but occasionally a Maine State Game Warden (that’s a back-country law enforcement officr) will patrol by snowmobile on the lookout for drunk snowmobile drivers (as well as snowmobile accidents and wildlife poachers). 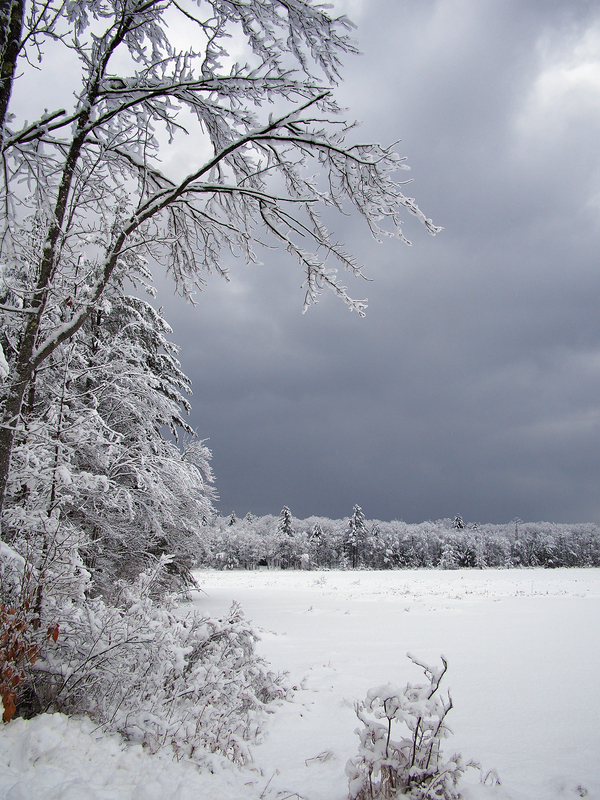 The pre-Christmas ice storm spelled disaster for the snowmobilers. 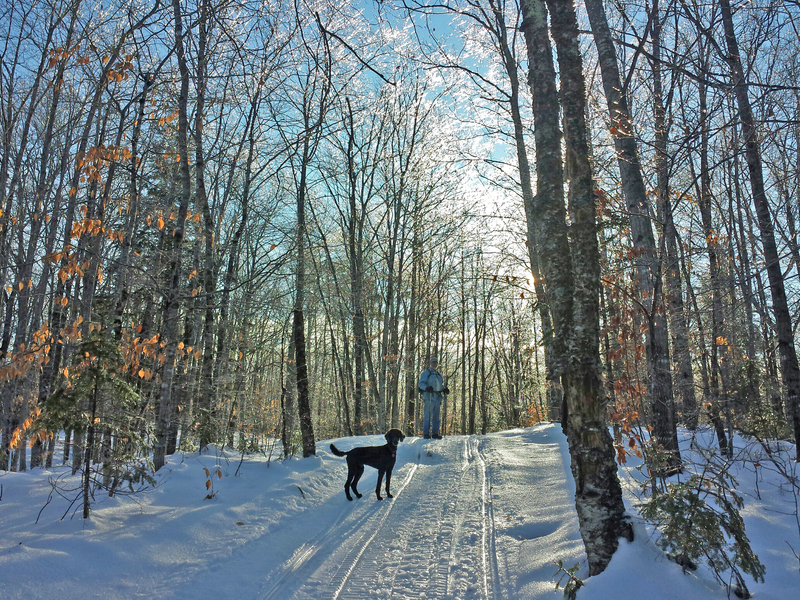 The trails had just been groomed before the storm, and now they were too icy to use safely. 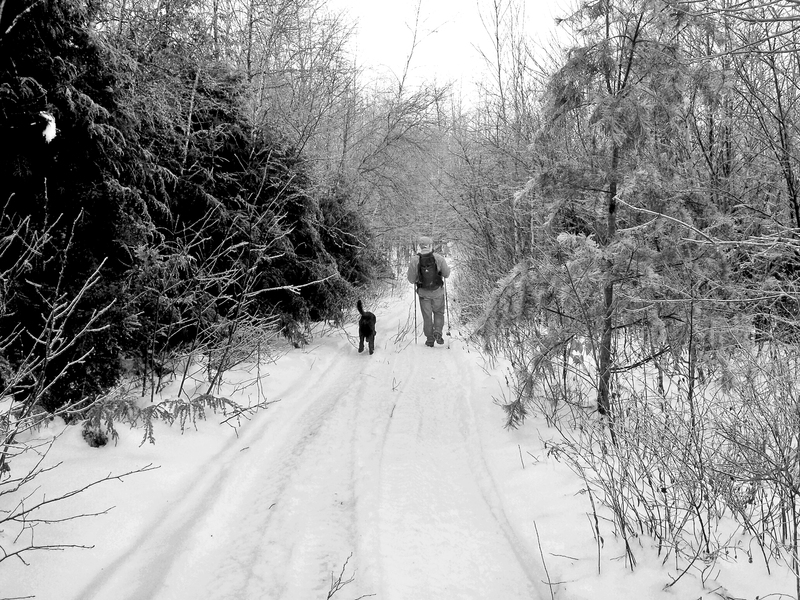 But for snowshoeing, these trails were a delight. 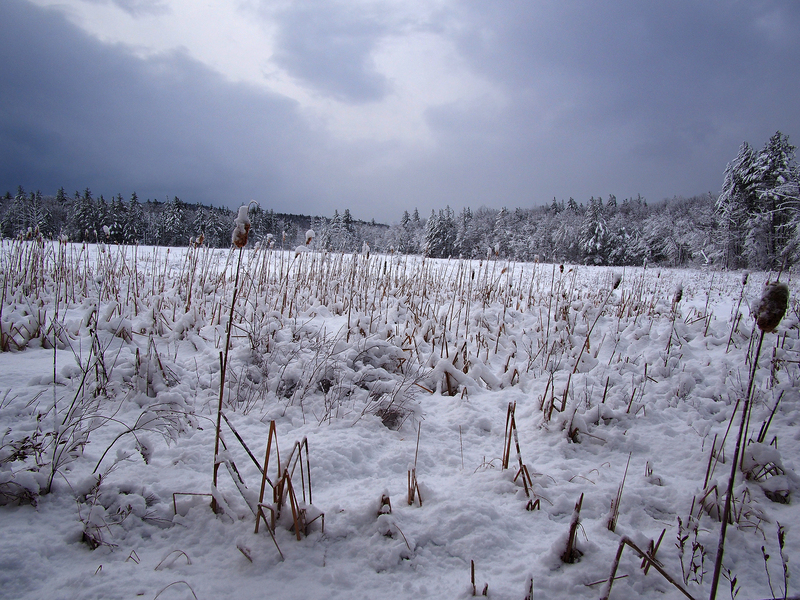 The snow was compacted so one didn’t sink down very far while walking, and the crampons of our Microspikes (sharp pointy metal blades that attach to the bottom of one’s shoe) gripped the ice tightly to make walking easy. We decided to take a hike in our own backyard wilderness along these trails. On Christmas Eve we went 3.5 miles; and on Christmas Day we ventured 4.7 miles. I wore a long-sleeved hiking shirt with a light fleece jacket, leggings, hiking boots, crampons, a wool hat, sunglasses, and I carried trekking poles. My husband (poor guy!) also carried a daypack in the event of an emergency: water, flashlight/headlamp, topo GPS, toilet paper, Purell, a face mask, cellphone, chewing gum, first aid kit, fire starter kit, knife, hand-warmers and foil emergency blanket, multi-tool knife, ham radio and extra crampons and gloves. We take winter preparedness seriously, even for short distances (we were only gone for two hours)! We had a wonderful time. 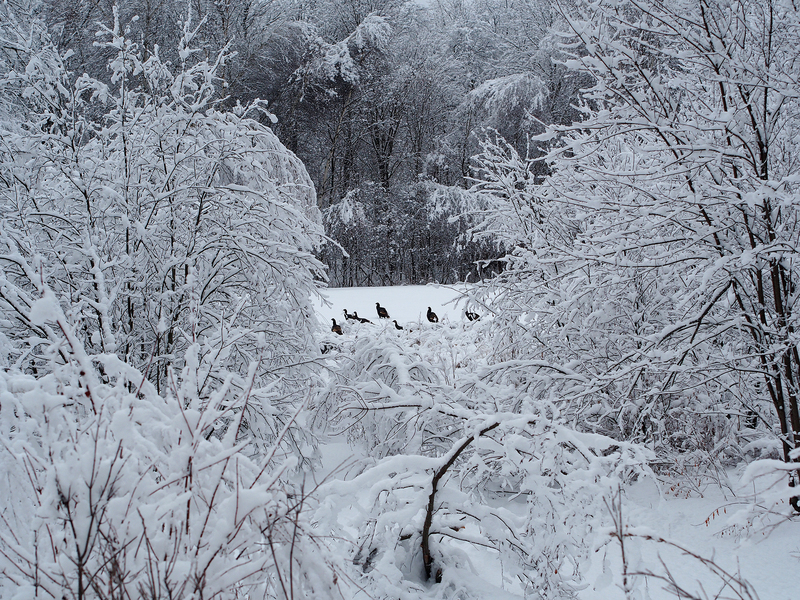 There was no one else out and about (this being Christmas, after all) and the woods were quiet, cold and beautiful. 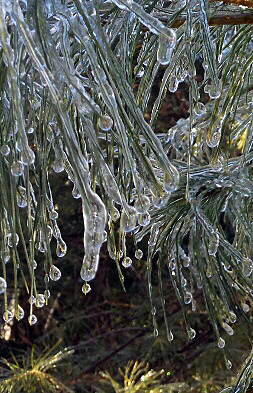 The ice that coated the tree branches glistened in the sun, looking like a million sparkling diamonds. We came home to hardy, homemade soup and freshly baked whole wheat rolls hot out of the oven, and later, a wonderful, hot bath. We still can’t believe how blessed we are that we are surrounded by so much beauty. 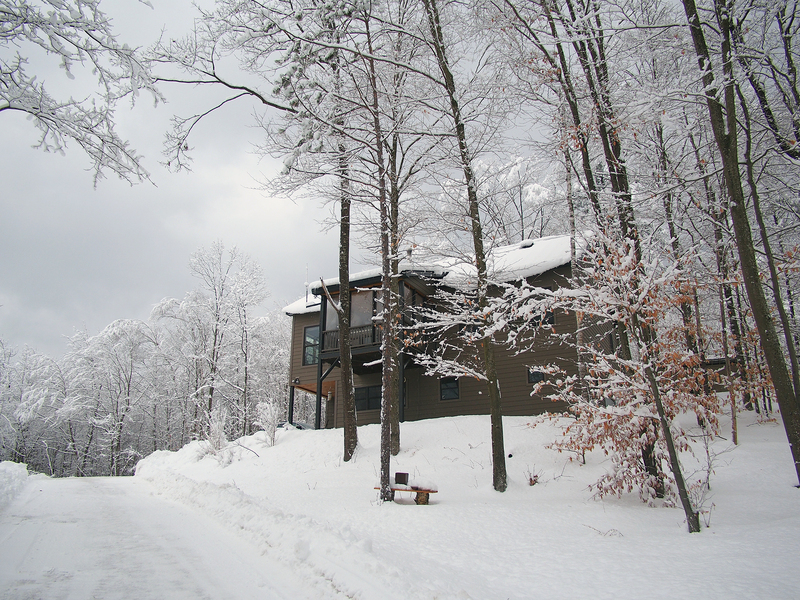 There is so much to do literally outside our front door, without having to drive anywhere. Even though I am still very overweight, in terms of stamina and strength I am in the best physical shape that I’ve been in since my youth. Here in the Maine woods, life is good! Many people are surprised to find out that I don’t own a dryer – – by choice. “How do you get your clothes dry in the wintertime in Maine?” they all want to know. When 11 of my grandchildren came to visit me at the same time in Maine this past summer, the clothesline was ALWAYS occupied every single day that they were here, and I sometimes did 3 loads of laundry per day. And when they left and I needed to wash 14 sets of linens and towels, I opted for the laundromat, although if I’d had a little patience to wait for sunny summer days (the forecast was for rain) I could have shlepped out this task over a number of days with just my washer and clothesline. I find it especially relaxing and not at all tedious to hang laundry outdoors (except at the height of blackfly season in May, when I must wear a bug headnet, have every inch of skin covered, and be doused in DEET insect repellant). My washing machine is a second hand Miele, manufactured in Germany, but bought on craigslist on the cheap, and it does a fantastic job of getting clothes clean using a minimum amount of water and energy. But the really amazing thing is that on the final cycle, my Miele spins the clothes nearly dry at 1200 rpm. So when the wash is done, the clothes are barely moist and drying takes only about 30 – 45 minutes on a sunny summer day. Unless I’m desperate, I don’t even bother doing laundry on a cloudy winter day: the sun is psychologically crucial to success. But even that is not so bad. If there’s rain, sleet, snow or clouds, I do my laundry at night, and put it on an indoor drying rack 4′ from the woodstove. By the time I wake up in the morning the laundry is dry. That said, I still prefer hanging the clothes outside – – the crisp, fresh mountain air makes the clothes smell so wonderful! But in winter the timing can get tricky, and the hours of daylight are few. For one thing, after a snowfall, I have to clear a path to the clothesline and then create a walkway underneath the lines, where I stand to hang the clothes. Also in winter, it is essential to wear fingerless gloves because otherwise the skin of your fingertips can freeze to the damp clothes as you pin them on the line. Wearing crampons on your boots is also helpful, lest the path you made through the snow the day before has meanwhile turned icy overnight. In really cold weather, the wet clothes freeze hard as boards almost immediately, even as you’re putting them on the line. You also need to work quickly so the damp clothes don’t freeze to one another as they lay in the laundry basket. If you try to separate the clothes that freeze together you could literally break off a hard, frozen sleeve or pants leg while trying to separate them. But the trickiest thing is knowing when the clothes are dry, because they are so freezing to the touch one might mistake them for being wet, when really they are just cold. So here’s the trick: if they are soft to the touch, even if they are very cold, the clothes are dry. If they are stiff, they are still frozen, and if they are frozen that means that there is still some dampness and moisture in them. Dry clothes don’t freeze. And here is another amazing fact: you don’t need heat to dry clothes quickly. Ever hear of “freeze-dried” produce or coffee? The product is frozen in its “wet” state, and then the air is drawn out in a vacuum. 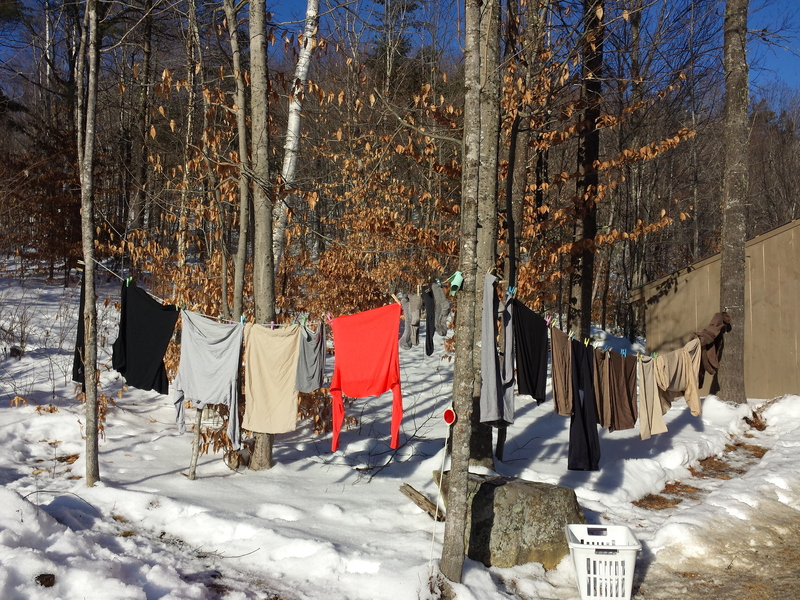 The process of drying laundry on an outdoor clothesline in winter temperatures isn’t much different. 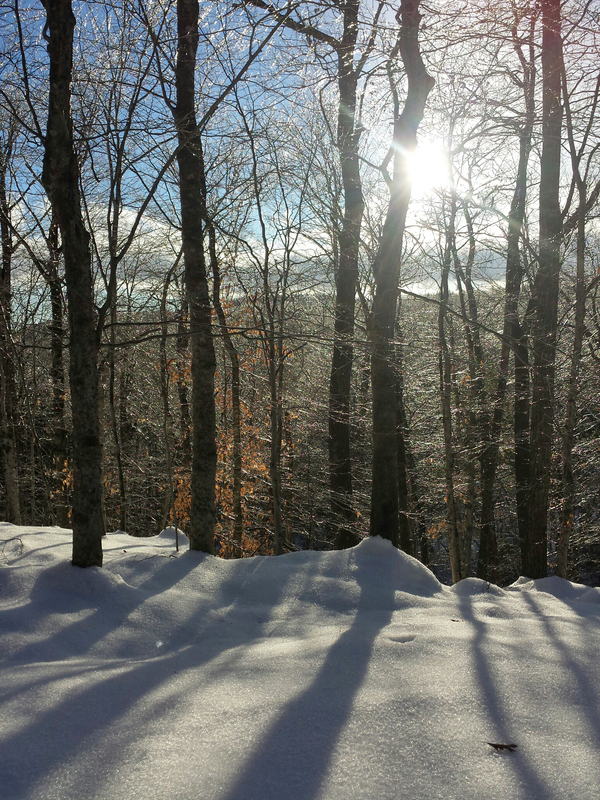 Once the wet clothes freeze on the line, the sunshine and wind and cold air draw out the moisture. My laundry is dry in as little as one to two hours, even if temperatures are in the single digits! The degree of mentschlichkeit by complete strangers (the art of being a nice, kind, decent and upstanding person) found in rural New England never fails to delight and surprise me. Conversely, I am sorry to say that when I return to my hometown on the East Coast, I am frankly astounded not only by the huge number of rude and unhelpful and apathetic people; but also how nice, normal people living there seem to think “that’s just how things are” and that they’ve become complacent and put up with such bad behavior. They feel dread and defeat before they even go into the store! (Not to mention the fear of being mugged in the parking lot.) I will spare you the ugliness of my daily shopping travails in my home town, but I do wish to relate what is more typical behavior in New Hampshire and in Maine. When you walk into a store in rural New England, whether it’s a mom-and-pop hole-in-the-wall or a Big Box store, you are greeted with, “How can I help you today?” The thing is, they really mean it. At first I was taken aback – – do I really look that old and helpless? But I noticed that neither age nor gender is a factor. This is just what they do. The customer comes first and so does his satisfaction, even if the employee leading you by the hand makes a measly minimum wage and his prospects for promotions or long-term employment in that store do not look particularly bright. And it’s not just a particular Wal-Mart (or Home Depot or Lowes, supermarket chains, etc.) – – it’s every single Big Box store I’ve been to anywhere in Maine or New Hampshire. If the item is not on the shelf, they will voluntarily go to the back of the store and try to locate it for you, and if they can’t find it, they will check their stock list for current inventory and find out when a new delivery is expected. While at Wal-Mart I loaded up on cereal. One type had a peel-off coupon on the box cover saying that the manufacturer was giving a free pound of bananas for every box of cereal bought that had the coupon sticker. Unfortunately, however, I was unable to make use of this coupon since this particular Wal-Mart was not a “super” Wal-Mart and they did not carry any fresh produce. Once my purchases were made, I headed to Hannafords, a pleasant supermarket chain that is found throughout Maine and New Hampshire. I put some bananas into my cart, and went in search of goat’s milk, which I digest more easily than cow’s milk. Unfortunately, they were out. Okay, the bananas were not worth more than $.57. But that’s hardly the point. It’s clear all of these stores value their customers, and wish to have an ongoing and loyal symbiotic relationship. I told my “free bananas” story to many of my friends from my hometown and they were shocked. “That would never happen here,” they unanimously agreed. The thing is, once you’re away from an environment where bad behavior, cynicism and apathy are the norm in consumer relations, you begin to realize something: you really don’t have to put up with it. You do have a choice. And if you can’t find a place where basic decency and respect reign, then it’s time to go elsewhere where people do act like mentschen. Those places and the good people in them do exist everywhere, of course. And yeah, I know what I’m about to say sounds harsh and snobby. But it’s just so refreshing to not have to look very hard, and to live in a place where mentschlichkeit is the paradigm, and not the exception to the rule. I live very close to several rural libraries. 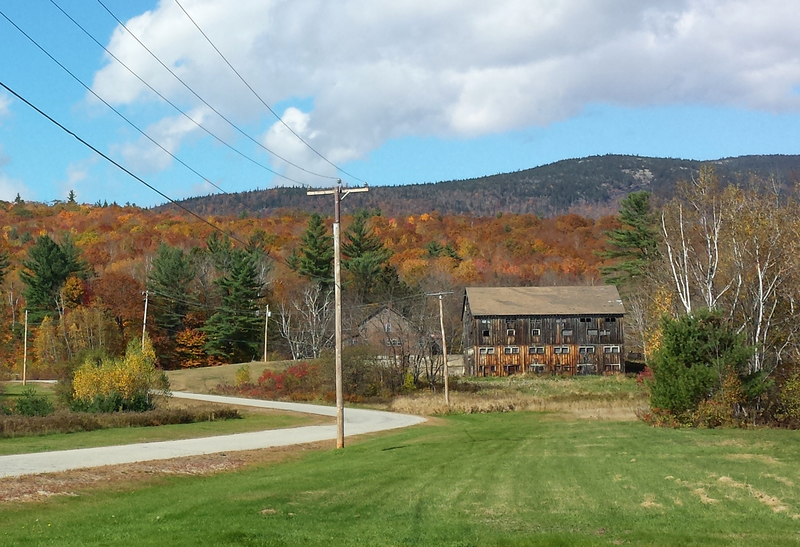 The one nearest to me, only 3 miles away, is a former one-room schoolhouse in North Lovell. It is only open twice a week from 5:30 p.m. – 7:30 p.m. and it draws two or three “regulars” who come more to shmooze in their thick Maine accents, than to read (in so doing, I have learned much about local culture; it’s extremely friendly and haimish – – the wood floor creaks; other than a limited amount of current bestsellers the rest of the books were last popular in the 1950s; they have a complete collection of Stephen King books, which is really more like a shrine; the small interior is so loaded with books that you can’t easily walk around; and they have free Wi-Fi.) About 10 miles down the road is the Lovell Library, which is extremely modern thanks to a $750,000 donation by Stephen King. There are also libraries in Bridgton, Waterford, and Norway in Maine, as well as in Conway NH (these are about a 20 – 25 mile drive but in these parts that’s considered local)..
None of the libraries had any relevant books, although I could have ordered older editions which don’t support the current versions I’m now using, through an inter-library loan. But for now it looks like I will be watching amateur how-to clips on youtube and buying books sight unseen from amazon.com I guess I should feel fortunate that living so remotely, the world (and its commerce) is literally at my doorstep with the click of my mouse (thank you, UPS). That said, I thought you’d enjoy hearing about my conversation with a rural librarian on the phone. The branch shall remain anonymous. Me: Do you have any books on Lightroom 5? Librarian: Never heard of it. Me: It’s a popular computer program for photographers. I am hoping to find a book that will help me learn to use it. Librarian: Well, I’ve never heard of it. And if I haven’t heard of it, we probably don’t have it. Me: Uh . . . would you mind checking? Librarian. Oh . . . okay. Give me just a minute while I turn on the computer.